Welcome to Bahasa Indonesia Class! Selamat Datang di dalam kelas Bahasa Indonesia! Why did I chose Inquirers? In Bahasa I think I am more an inquirer rather then being knowledgeable, as I still often ask my teacher what the translation is of an English word to an Indonesian word. I hope to improve this by reading more Indonesian books, and willing to talk more Indonesian often. Bahasa Indonesia class overall is very fun, and not boring at all. My chosen work is my brochure. I chose this work because it thought me a lot of important lessons, which could change the grades of many of my works. My overall score was a 3 out of an 8. A terrible score, and not something to be satisfied with after all effort is lost. This happened because the brochure I printed and gave, was the uncorrected brochure. This thought me to always double-check my work before I turn it in. 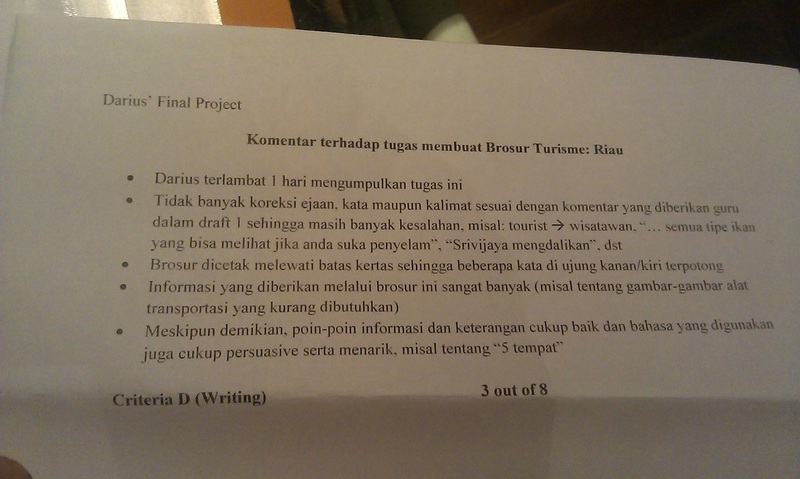 I hope to keep this lesson in mind, and hope to get a better score for Bahasa this quarter 2.